eBook: Digital Transformation – What’s In It For You? New technologies are opening up new opportunities for business. They are driving a revolution known as DIGITAL TRANSFORMATION, where processes are simplified, ideas are implemented, and businesses are benefiting like never before. 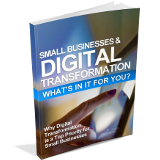 We have written a free eBook that explains what digital transformation is, and the possibilities that even small changes can provide to your business growth. Click here to subscribe to our monthly newsletter and access your copy of this book – don’t worry we won’t share your details and you can unsubscribe at anytime. If you are already a subscriber and would like a copy please email david@dpcomputing.com.au. You will also get a free copy of our other eBooks including the following so sign up now! Is Your Old Tech Dragging You Down? Spectre and Meltdown: How you’ll be affected. What is the Best Way to Backup Your Data? Cloud or NAS Device – Which is Better? Don’t Fall Victim to the Webcam Blackmail Scam | DP Computing's Blog on Time to change your passwords. Invest In Your IT Security - Before It Is Too Late! on Is Your Actual Physical Security as Good As Your Cybersecurity?